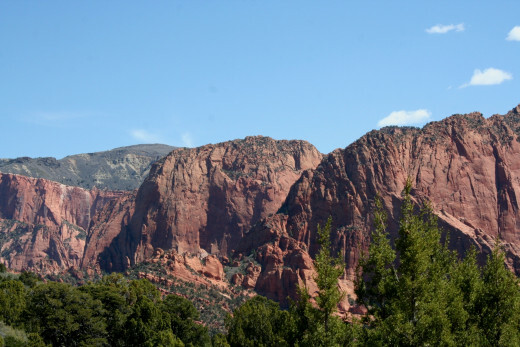 What does Kolob Canyons scenic drive have to offer? 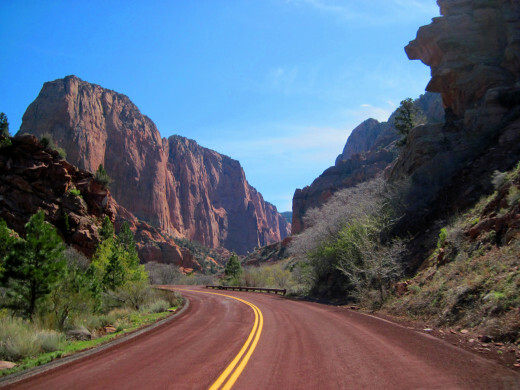 The very first thing you will notice when entering into Kolob Canyon is how red the road is. They obviously use local materials to create the road. The road itself is just an eye catcher, you travel on part of Zions below your tires. They use a lot of natural materials in these parks, which I find very cool! 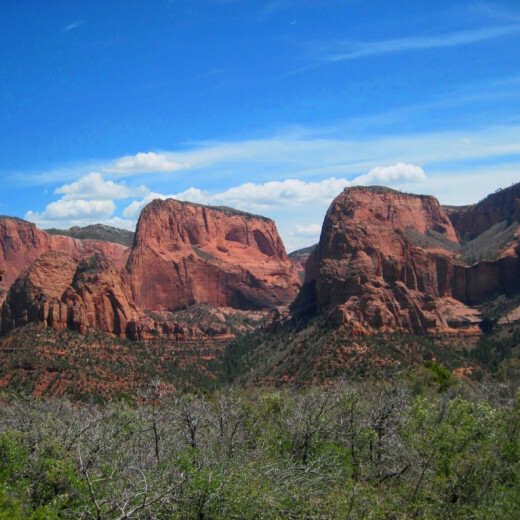 Kolob Canyons has a very red road that winds about five miles back through a really interesting canyon. It really makes for a great short trip that can be done in just a couple of hours. You will wind though on this red road, on the edge of a beautiful valley, wider than Zions Canyon. At the very end there is a scenic Timber Creek Overlook Trail that I highly recommend if you are physically up to it. It is only one mile round trip, but it does go up about 100 feet in elevation so a bit of a hill. It is not very wheel chair accessible in my opinion, though I did see someone on it with a baby stroller. Accomplished hikers will find this trail very easy. But those not used to much outdoor activity may have to rest a couple times on the way up. There is a sign that says to find the hanging Valley. If you look at the above photo you can see it clearly on the right. See the dark mineral stains of the waterfall, when it rains hard this becomes a waterfall, that is very short lived. There is a hanging valley lies above it. 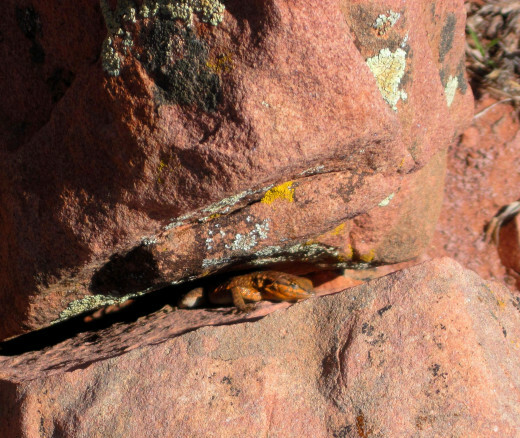 The informational sign told us that you can see this pattern throughout Kolob Canyons and in Zion Canyon. To look for the telltale tracks of high waterfall that mark the lip of the hanging valley. It also stated that "originally the upper, side canyons stream was a tributary connected to the main canyons stream. Uplift along the main canyon wall separated the side canyon. In time the side canyon was marooned, hanging a thousand feet above the main canyon floor." The dark streaks on the rock are reddish iron and purple manginese on the side of the rock cliff when the water evaporates into the air. The rock cliffs are constantly changing as erosion and breakage occurs with time. Look how the layers in the rock tilt in different directions. You wonder what was happening a the time this canyon was created? Earthquakes perhaps. 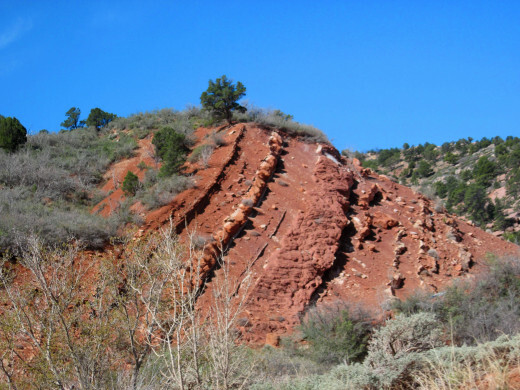 Did large parts of the land rise, or did they fall? Shade trees are few and far between on the trail. This one even has a nice little rock to sit on beneath it. You always want to check for snakes and other creep crawlers under neath ledges before sitting. 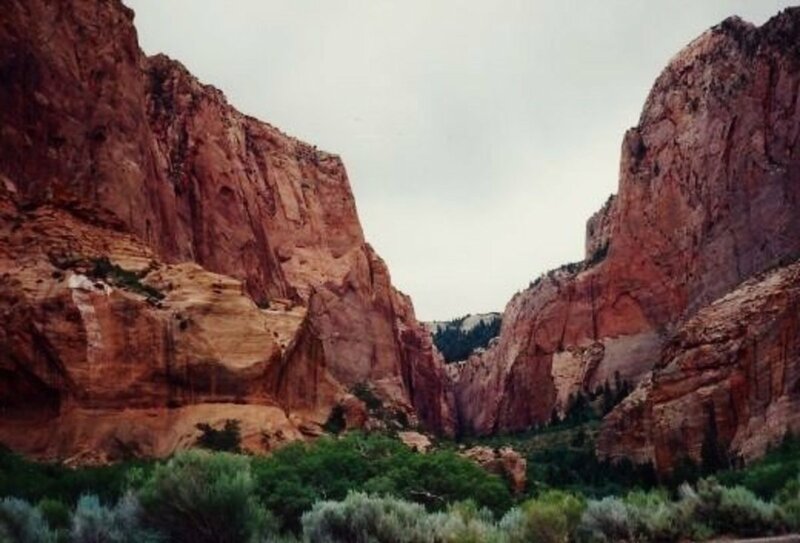 The entrance to Kolob Canyon Road is just off of I-15 at exit 40. Horse Ranch Mountain or Paria Point which is higher? The view above is of the Horse Ranch Mountain and Paria Point taken from the observation point across the valley on the trail. Horse Mountain is on the left, that tall green mound is the peak and Paria Point is on the right. Which one looks higher to you? Horse Ranch Mountain is the highest peak in the Kolob Canyons, it comes in at an elevation of 8726 feet high, or 2659 meters. It is really strange because when you look at the entire range with all the mountains, it does not look much higher than the others. 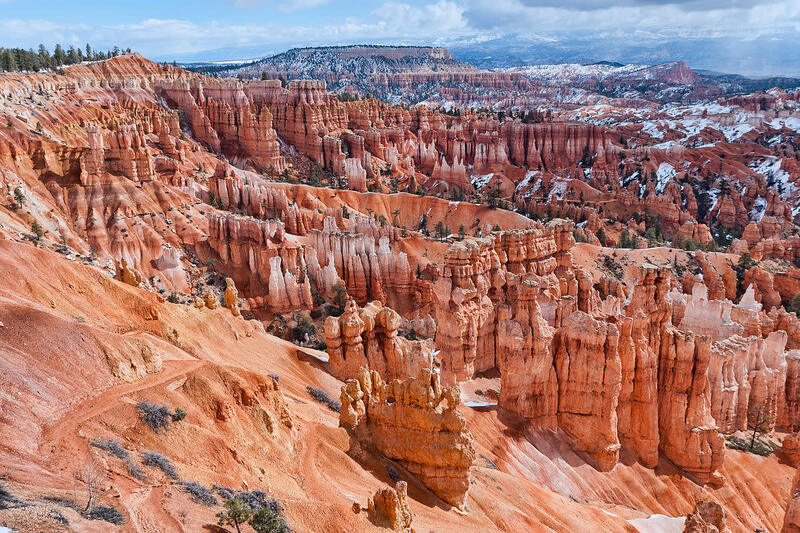 Paria Point comes in at a mere 8147 feet in height, or 2383 meters. 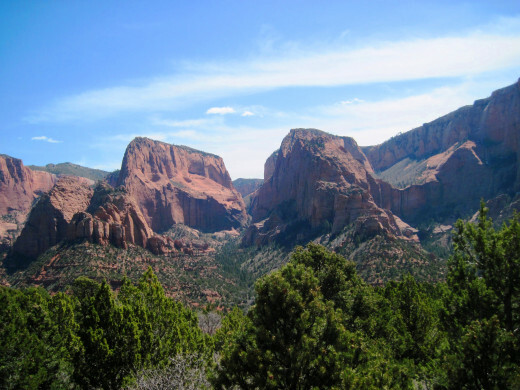 Depending on what you plan on doing above are some recommended things to bring with you to Kolob Canyons. Just above is a view of the Beatty Point taken from the observation point across the valley. Look at the shelf she had mid way down. Looks like a great place for mountain climbers to take a break. Beatty Point is 7520 feet high at its peak. There is a trail called Taylor Creek Trail that takes off just to the left of Beatty Point in between Beatty and Paria Points. 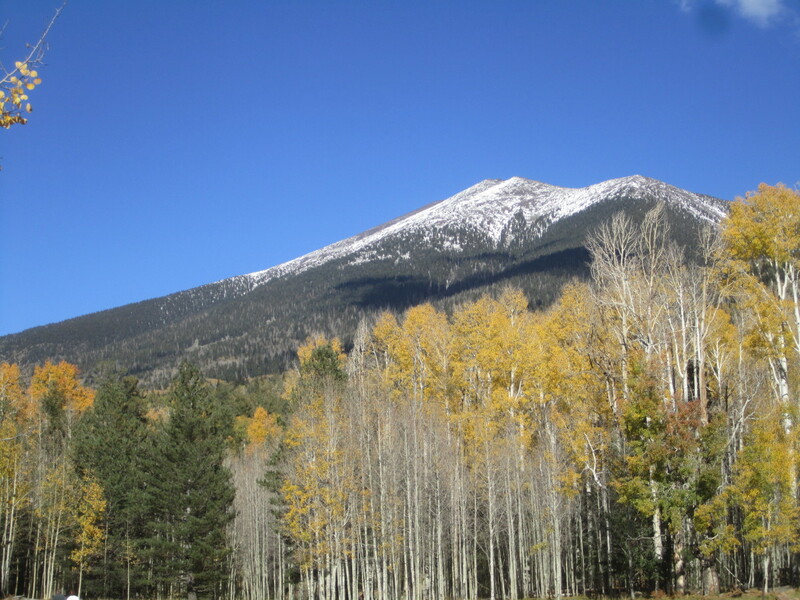 The trail is around five miles round trip and is a good four or five hour hike with an elevation rise of 450 feet. This trail goes past two cabins built in the 1930's and ends at the Double Arch Alcove which is a large grotto below the arch. Watch for wildlife; Golden Eagles, deer, or maybe even a lizard or two like the one in the photo below. 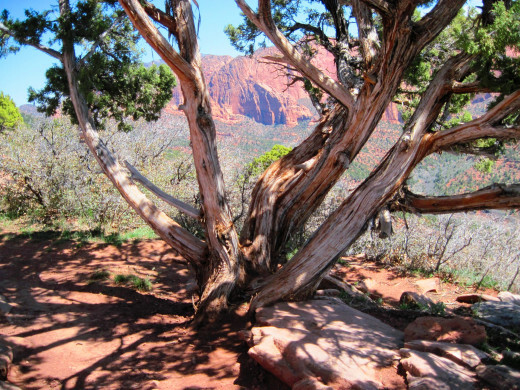 Have you been to Kolob Canyons? You get an awesome view (seen above) of the Nagunt Mesa from the Timber Creek Overlook Trail and this mountain is 7785 feet high. It really is worth the hike to the top of Timber Creek trail. 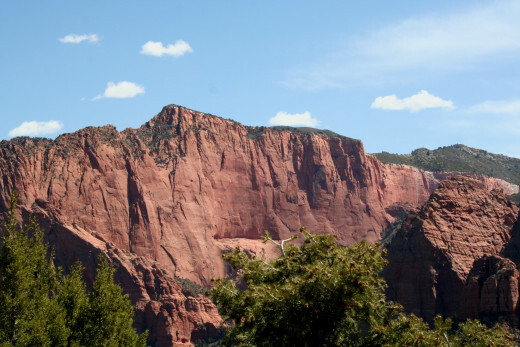 The most spectacular mountains lie at the end of Kolob Canyon in my opinion; Timber Top Mountain which is 8055 feet high and a much shorter Shuntavi Butte that is 6995 feet in elevation. The view from the End of Kolob Canyon just goes on and on. From the top of the Timber Creek overlook trail you can see, on a clear day, Mt. Trumbull 100 miles away at the north rim of the Grand Canyon. How cool is that? You can see cut outs of deep Canyons. How fun it would be to hike further and explore more! 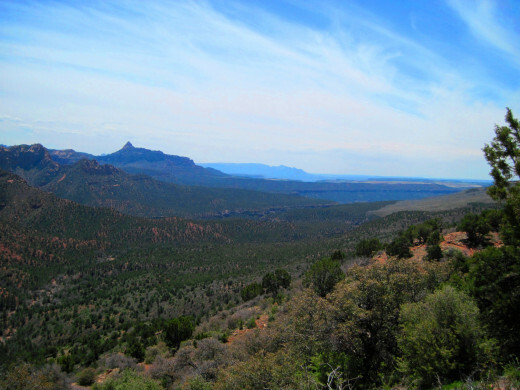 Did you know that the Canyons in Kolob are considered Wilderness Area? There are very specific guidelines that you must follow when hiking, or camping in the area. Check their official website for further information. When hiking this trail or any others, please watch for rattlesnakes. There are warning signs for them. They limit the number of people in large groups to only twelve on the longer trails. This is to limit your impact on the environment. Pets are not permitted on any trail. You need a map if hiking trails or some type of navigation device if hiking in the back country. Water is an absolute and lots of it. Zions recommends each hiker packs one gallon of water per person, per day. Walking sticks are highly recommended. I was amazed how much they helped when hiking uphill or down, they helped steady my step. They helped take some of the pressure off your legs and allows your arms to get some well needed exercise too. Love the walking sticks or trekking poles! You have to have a camera, whether you just use your cell phone or pack a camera to fit a lot more photos in or both. You will love going through and looking at the beauty you experienced at each place along the way. It is a good idea to have a first aide kit no matter where you go. I recommend always having one as well as plenty of water, and protein snacks. Zion National Park in Utah ~ Monolithic Domed Splendor! Copper Canyon Passenger Train in Mexico - What a Ride! State High Points of the United States: A brief overview. What do you think, is it worth a visit? You are very Welcome Nell Rose, thank you for stopping by. Hi, what a beautiful place! all those wide open spaces, thanks for sharing this, it looks amazing! Beautiful photos. 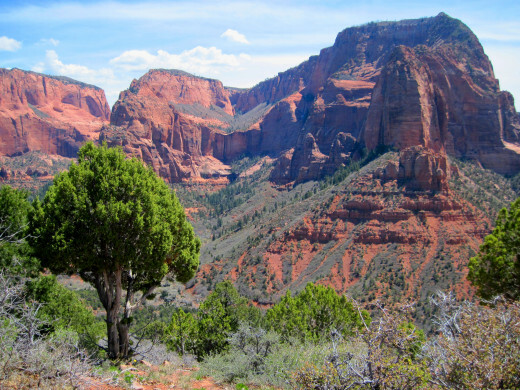 A (quick) virtual trip to Zion National Park. 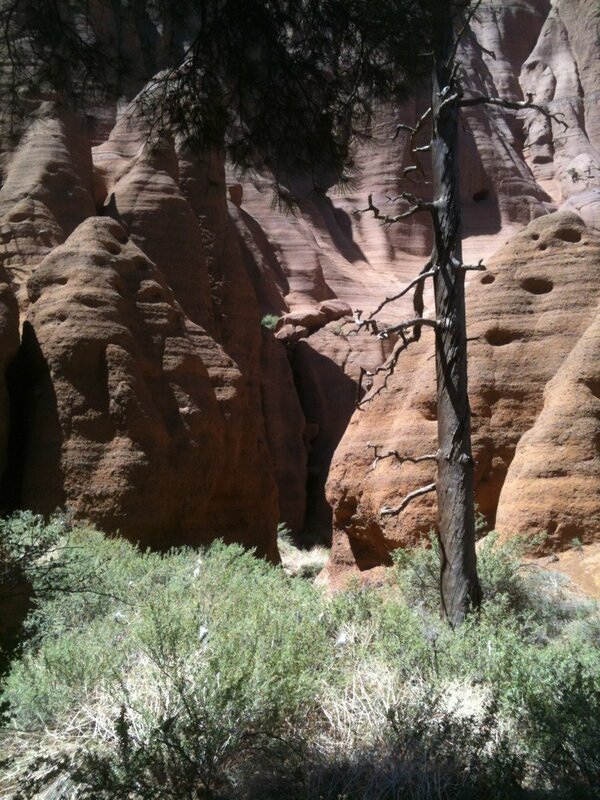 Thank you Paul, it is just a little tidbit of Zion, which is really pretty. Appreciate your kind words and for visiting here! 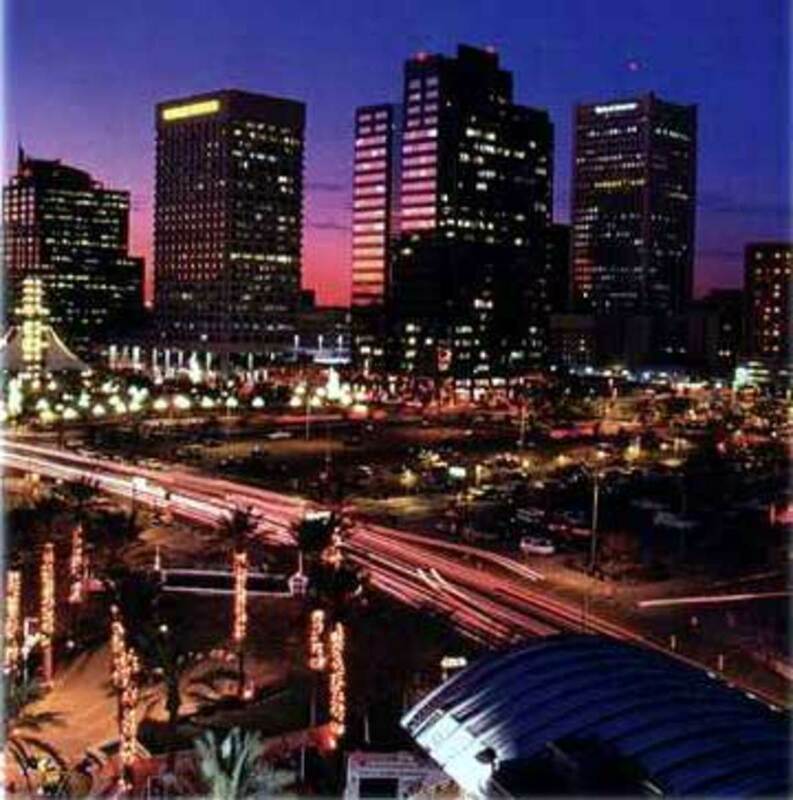 Looks like an amazing place and such incredible pictures - I really enjoyed my visit via your page! Thank you both so much for taking the time to stop by and leave a comment. Rose I am sorry you had so much rain on your trip as it tends to make Zion a bit dangerous, with all the potential for flash flooding. I hope to make it back there too. Much more to see. Paige, I highly recommend it. I really is unique and worth a visit. Wow, I really didn't know much about Zion, but it's gorgeous and I'm hooked! Next time we drive cross country we have another place we absolutely must stop! Thanks for sharing, Linda! Very informative hub, Linda. Great photos too. My stay at Zion was only 2 days and the first day it rained so I didn't get to explore as much as I wanted. This is great information for my return trip!